Carol Witherbee is a vocalist, music educator, choir director, plays the dulcimer and has directed local theatrical productions. She began her career in the Alpena Public Schools teaching music in the elementary classroom in the late 1960s. Mary Ann Hubbard talks about her role as an music educator and performer. She has taught music at ACC, Blue Lakes Fine Art Camp, Resurrection Lutheran Church School of Music and privately. MaryAnn performs in the Alpena Symphony Orchestra, The Windsong Quartet and organizes the annual "Flute and Friends" concert. John Milroy presents his experiences from World War II. His presentation was based on his book "Milroy was There". 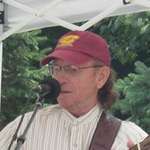 Guitar player Glenn Anderson talks about playing music in the Alpena area, in Texas and recording in Nashville.Glenn plays country music primarily and some polka music as well. He started out with locally with Bussey String Band and discusses other players and venues in this interview. Area piano teacher and performer, Loretta Beyer talks about her roles in the Alpena music scene as well as her own music education in Zimbabwe. Lifetime Long Lake Resident, Clarise Grzenkowicz talks about working as a cutter at The Alpena Garment Factory from 1935-40. In addition to discussing the working environment at the factory, Clarise describes day to day life in Alpena at that time.